Do you remember when you as a child and all the children got together to play there was always one child that wanted everything his way or he would throw a tantrum. No compromise spoiled little brat off he would go yes he would go home. Well this is Obama spoiled selfish no compromise and blames everybody else for his attitude. Yes he is an elegant speaker tells people won the democratic party what they want to hear. Or what they think they want to hear the stair in this nation apart and all the people that voted for him I hope by now you’ve got your fill it’s not always about the party that’s about what’s best for this country. And that is definitely not his objective it’s about himself and his prestigious attitude. Well he needs to take its football and go home and buy a home I mean back to Chicago he needs to resign which we know he won’t so therefore he needs to be impeached people wake up he is destroying our country he is destroying our country.. Remember our children and grandchildren will be left the mess and when they’re old enough and ask you why did you allow this to happen what are you going to tell them. Comments Off on Obama destroy our country!! Kerry Signs Global Gun Control Accord in Wake of Obama’s Renewed Calls for "Transformation"
Many at the time wondered exactly what sort of “fundamental transformation” was needed in what was already the most prosperous, peaceful, just, egalitarian, and powerful nation the world has ever known. A simple return to first principles, some would argue, is the better prescription to preserve the country’s preeminence in the future. Nevertheless, taking his cues directly from the anti-gunner’s playbook we reported on recently, President Obama last Sunday turned a memorial service for victims of a heinous crime into a platform to call for yet another “transformation,” this one in the federal gun laws under which the nation’s violent crime rate has fallen to a 42-year low. In a breathtaking display of opportunism and self-centeredness, an event meant to display a nation’s mourning and remembrance degenerated into an expression of the president’s personal agenda and his vision of a “transformed” America. Perhaps we were too harsh on textbook publishers last week for botching the proper interpretation of the Second Amendment, as even those in charge of the official website of a body sworn to “support and defend the Constitution of the United States” apparently can’t be expected to get it right. The official website of the United States Senate features a “Virtual Reference Desk” section on the Constitution which offers an explanation of the Second Amendment that reads, “Whether this provision protects the individual’s right to own firearms or whether it deals only with the collective right of the people to arm and maintain a militia has long been debated.” The passage downplays the individual right to keep and bear arms guaranteed by the Second Amendment and gives undue credence to an interpretation of the amendment long-held in disrepute and rejected by the U.S. Supreme Court in 2008 and 2010. Last week, the FBI released its national crime report for 2012. By a slight margin, the nation’s violent crime rate decreased in 2012–relative to 2011–making it the lowest it has been since 1970. Compared to 1991, when it hit an all-time high, violent crime is down by 49 percent. The nation’s murder rate was unchanged in 2012; still lower than any time since 1963 and at nearly an all-time low. Between 2011 and 2012, 24 states and the District of Columbia experienced decreases in their murder rates. There was no correlation of these trends with the severity of the states’ or the District’s gun control laws. Troubled Detroit, under Michigan’s law requiring a permit to purchase a handgun, had the highest murder rate among large cities, followed by Baltimore, under Maryland’s law imposing a seven-day waiting period on handgun purchases. The 2013 NRA “Firearms Law & The Second Amendment Symposium” will be held on Saturday, October 12th, at The University of Denver. Focusing on recent developments in our nation’s courts and legislatures regarding the Second Amendment, speakers will discuss and debate current Second Amendment developments and related issues. VIRGINIA: “All In” in Virginia! Comments Off on Kerry Signs Global Gun Control Accord in Wake of Obama’s Renewed Calls for "Transformation"
You know what this means. Now Obama and the U.N. are one BIG step closer to wiping out our Second Amendment freedom, our national sovereignty, and our American rule of law…once and for all. 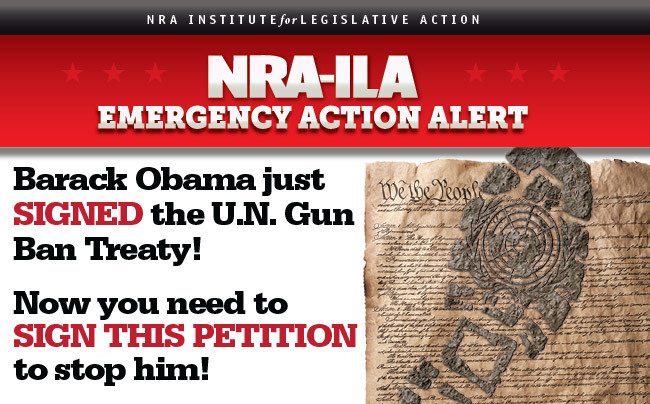 Please sign NRA-ILA’s Emergency Petition to the U.S. Senate as soon as you can. Only the Senate can ratify treaties, so it’s up to you and me to convince an overwhelming majority of U.S. Senators to vote NO on the U.N. Arms Trade Treaty. And we have to do it RIGHT NOW. That’s why every petition counts, starting with YOURS. With your help now, NRA-ILA can launch a BLISTERING ad campaign that exposes Obama’s treachery. We can blanket the Senate with hundreds of thousands of these petitions. We can put every critical NRA-ILA campaign tool to work and stop this dangerous treaty before it becomes the law of the land. But we can’t do ANY of it without a generous commitment from you TODAY. SO TRUE – AND KIDS TURNED OUT SO MUCH BETTER THAN TODAY WITH THEIR GIVE ME & THROW AWAY ATTITUDES. The young clerk responded, “That’s our problem today. Your generation did not care enough to save our environment for future generations.” She was right – our generation didn’t have the green thing in its day. Good reasons to support the effort currently playing out in the Senate to defund Obama care. WE KNEW THIS WAS COMING…BE SURE TO READ. This is from a good friend, who is a lawyer and specializes in insurance law: Tom Greenstone, M.D. THIS should be read by everyone, especially important to those over 75……. Your hospital Medicare admittance has just changed under Obama Care. You must be admitted by your primary Physician in order for Medicare to pay for it! If you are admitted by an emergency room doctor it is treated as outpatient care where hospital costs are not covered. This is only the tip of the iceberg for Obama Care. Just wait to see what happens in 2013 & 2014! At age 76 when you most need it, you are not eligible for cancer treatment. What Nancy Pelosi didn’t want us to know until after the healthcare bill was passed. Remember she said, “We have to pass the Bill so that we can see what’s in it.” Well, here it is. “Finally, it is specifically stated that this bill will not apply to members of Congress. HAD ENOUGH???? All of the above should give you the ammo you need to oppose Obamacare. Please send this information on to all of your email contacts. Comments Off on Good reasons to support the effort currently playing out in the Senate to defund Obama care. Comments Off on Halloween is Coming.